Free Gorilla t-shirt with new membership! Free Gorilla Combat t-shirt with new Membership! Classes are valid up to 6 months from the date of purchase. These packages do not include specialty classes or private training. Valid for unlimited classes in any and all disciplines. Valid up to one month from the date of purchase. This package does not include specialty classes, private training or sparring. A 6-month contractual agreement with auto-pay is required for the listed price. This option is also available without a contractual agreement for $140 a month or $130 per month with auto-pay. Valid for unlimited classes in any and all disciplines. Also includes unlimited sparring during designated spar times. Valid up to one month from the date of purchase. This packages does not include specialty classes or private training. Private training is available for individuals at a rate of $55-$65 per session depending on trainer. Sessions can be purchased in packs of 6 for a discounted rate. Private trainings for small groups are also available, please inquire for pricing. Are contracts required for Monthly Unlimited options? No, these options are also available on a month to month basis without the 6 month auto-pay agreement. With monthly unlimited memberships members can enjoy unlimited classes in all disciplines excluding specialty classes and private training. Unlimited membership is a great choice to try out various classes, focus on proficiency in any area or just get in consistent, effective workouts! Yes! We understand that you may be trying out a new training focus and have busy lives. 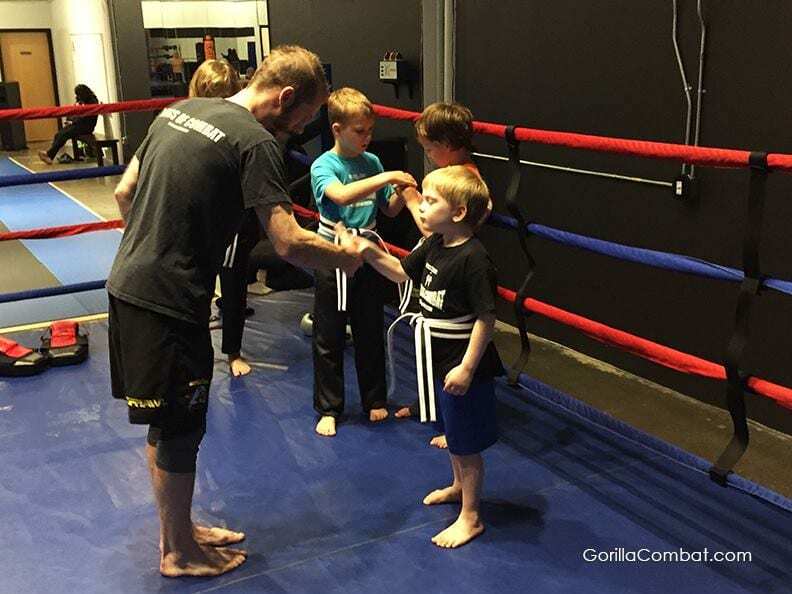 Gorilla Combat members are encouraged to join us under any membership you are comfortable with. Our staff is happy to assist with any changes and upgrades at a later time. Yes, there is a one time Enrollment Fee of $58. Boxing and Muay-Thai boxing require hand wraps and gloves for your protection. If you are new to either discipline and aren’t ready to invest in equipment, that’s okay, we’ve got you covered. Just come 15 minutes before class and we’ll help you get started.